With a warning earlier this week that severe H1N1 cases are beginning to be reported in younger adults around the country, the timing for a study and commentary on the benefits of early antiviral treatment for pregnant women with influenza that appears today in the Journal of Infectious Diseases couldn't be much better. 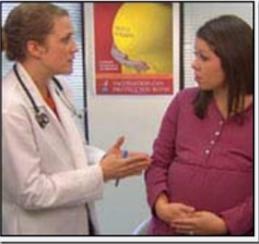 It is for this reason that flu vaccinations are so highly recommended for women who are pregnant (see CDC's Pregnancy and Influenza Vaccine Safety). But even with the vaccine, infection can sometimes occur, and here is where antivirals come into play. I've reviewed the evidence for using antivirals many times over the years, including The Conversation: The Rise & Fall Of The Challenge To Tamiflu and Revisiting Tamiflu Efficacy (Again). Although we've seen evidence of the value of treating pregnant women with antivirals in the past (see Study: Antivirals Saved Lives Of Pregnant Women), we have another study showing the outcomes for pregnant women hospitalized with lab-confirmed influenza, who either received antivirals early (< 48 hrs after onset), late (> 48hrs) , or not at all. Background. We describe the impact of early antiviral treatment among pregnant women hospitalized with laboratory-confirmed influenza (2010−14 influenza seasons). Methods. Severe influenza was defined as intensive care unit admission, mechanical ventilation, respiratory failure, pulmonary embolism, sepsis, or death. Within severity stratum, we used parametric survival analysis to compare length of stay (LOS) by timing of antiviral treatment, adjusting for underlying conditions, influenza vaccination, and pregnancy trimester. Results. Among 865 pregnant women, median age was 27 years (interquartile range [IQR], 23−31). Most (68%) were healthy, and 85% received antiviral treatment. Sixty-three (7%) women had severe influenza, 4 died. Severity was associated with preterm delivery and fetal loss. Conclusions. Early influenza antiviral treatment for pregnant women hospitalized with influenza may reduce LOS, especially if severe influenza. Influenza during pregnancy is associated with maternal and infant morbidity and annual influenza vaccination is warranted. The full study can be downloaded at Full Text (PDF). Past studies have suggested that flu antiviral therapy is safe and beneficial for pregnant women. The current study, based on data from a nationwide flu surveillance network including 14 states, focused on pregnant women hospitalized with laboratory-confirmed flu over four recent flu seasons, from 2010 to 2014. During the study period, 865 pregnant women were hospitalized with flu. Sixty-three of these patients, or about 7 percent, had severe illness. After adjusting for underlying medical conditions, vaccination status, and pregnancy trimester, the researchers found that early treatment with the antiviral drug oseltamivir was associated with a shorter hospital stay. Among pregnant women with severe flu illness who were treated early -- within two days of the start of symptoms -- the median length of stay was about five days shorter compared to hospitalized pregnant women with severe flu illness who were treated later (2.2 days vs. 7.8 days). Pregnant women hospitalized with less severe illness who were treated early also had a shorter hospital stay than those treated later, but the difference was not as great.